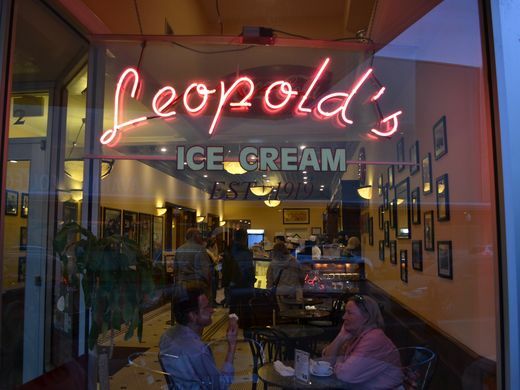 In the shadow of SCAD’s Trustees Theater, itself a blast from the past, Leopold’s Ice Cream drips with nostalgia, the old neon sign still glowing above the floor-to-ceiling shop windows. 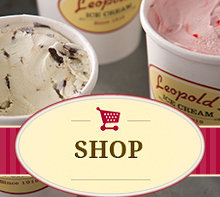 If you’ve been to Savannah, you’ve probably been to Leopold’s; if you haven’t, you should. Established in 1919 by Greek immigrant Peter Leopold and his two brothers, George and Basil, the parlor is now a downtown staple. Sitting before a dish of Tutti Frutti, a Leopold’s original (and a favorite of Johnny Mercer, who worked in the shop as a kid), my fiancée and I spoke with the owner himself, Peter’s youngest son Stratton Leopold. Though you may not recognize the name, you’ll probably recognize Stratton’s work outside of the shop, what he wryly calls his “day job:” Mission: Impossible III, The Sum of All Fears, The General’s Daughter and more. Born and raised in Savannah — in the original parlor, in fact, at the corner of Gwinnett and Habersham — Stratton took over the business after his father’s passing, but soon left Savannah to pursue his passion for film, landing in Hollywood via New York and Atlanta. In the late ’90s, he co-produced his first blockbuster, The General’s Daughter, starring John Travolta and Madeleine Stow. In 2004, he returned to Savannah to open the new Broughton Street location, mixing the vibes of the old-school ice cream parlor with mementos of his Hollywood career, the posters for many of the films he’s worked on now framed and hanging from the walls. In truth, he says, it hasn’t been the most convenient move. So much so, in fact, that he’s recently begun renovating the original Gwinnett and Habersham location with the hopes of opening a second parlor come early 2017. This one is more for the locals, he says, who don’t want to stand in a line of tourists snaking halfway down the block every time they want a scoop of ice cream.